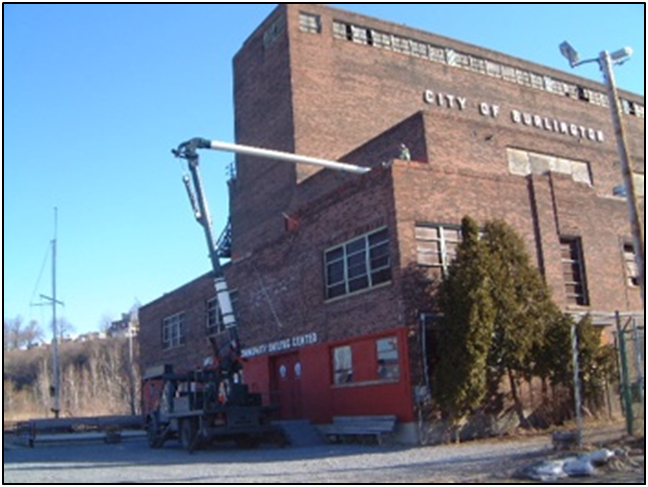 Waite Environmental Management, LLC (now WHEM) has worked for the City of Burlington Community and Economic Development Office (CEDO) since 2005 to characterize groundwater, soil, and indoor hazardous material at Burlington’s former electrical generating facility. This work has included a series of assessments using soil borings and groundwater monitoring wells followed by sampling of groundwater, surface water, shallow soil, and sediment on the 10-acre site. Results indicate the presence of low-level residual contaminants (chlorinated VOCs, PAHs and arsenic) in groundwater and shallow soil stemming from the former coal-burning facility, as well as some hazardous materials (lead, asbestos, bird guano) and physical obstacles (flooded basement) inside the Plant. The work culminated with a Corrective Action Plan in 2011 to guide the redevelopment of the site, which involves the construction of surrounding roads, bike path, skate park, and utility network. The 2011 CAP utilizes an approach that involves soil re- use and capping with geotextile and a clean soil barrier and an institutional control. WHEM is also teamed with New Moran, Inc. as the environmental consultant on the proposed rehabilitation of the Moran Plant as an event space, restaurant, and office space.